It's been another busy day and the weather is indeed improving, though it was still pretty horrid first thing. 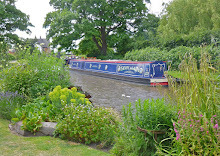 Having put on full waterproofs, I walked down into Poynton for meat, cash and other stuff. When I came out of Waitrose, I wasn't sure if I'd missed the bus, so hung about at the stop for a bit in hope rather than expectation. This strategy paid off; I had missed it, but Johnny from the yard was on his way back with the butties for the mid-morning brew and picked me up. This meant that I got back in time for the morning coffee and chocolate session. Sheila, meanwhile, was running a washload in the bungalow and refixing the signs that had been taken down by an unknown hand over the weekend. Dolce has come out of the yard and is tied on the Deeps, so the Braidbar collection is growing out here. After lunch, we made a start on washing and waxing the floor. In fact, whilst Sheila started, I cleaned round the Squirrel plinth. When she'd done her bit, engine room to study bedroom, I followed on with the wax. Finally, I got to try out the polisher we bought from Halfords the other month; with the finishing bonnet on, it did a great job of buffing up the wax. We were resting after all these labours when Graham off Priscilla II turned up and came to the Trading Post with us. Whilst we were all there, Austin and Liz off Just Siviting arrived. Both these boats are presently still on their moorings in Victoria Pit, but will be coming to join us on the Deeps tomorrow.